The nation’s payrolls added 250,000 jobs last month, the unemployment rate held steady at a 49-year low, the closely watched labor force participation rate increased, and year-over-year wage growth broke 3 percent for the first time since 2009. Given that inflation has been running a bit short of 2.5 percent, this means workers are finally seeing real gains in the buying power of their paychecks. Wages were up 3.1 percent for all private sector workers and 3.2 percent for middle-wage workers, suggesting that the tight labor market is generating broad gains, not just helping those at the top of the earnings scale. 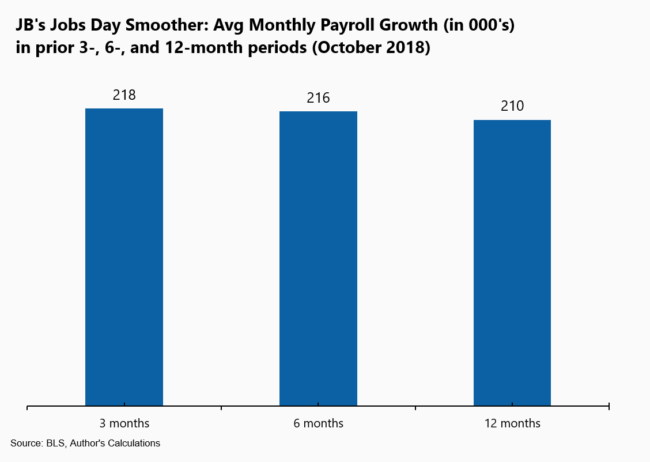 One slight caveat re wage growth is that in the previous October (2017), hourly pay in this series fell four cents in nominal terms, a rare event. Thus, the base off to which this October’s wage gain is compared was unusually low. However, the moving-average figures below, which smooth out such monthly noise, show clear acceleration in the pace of wage gains. 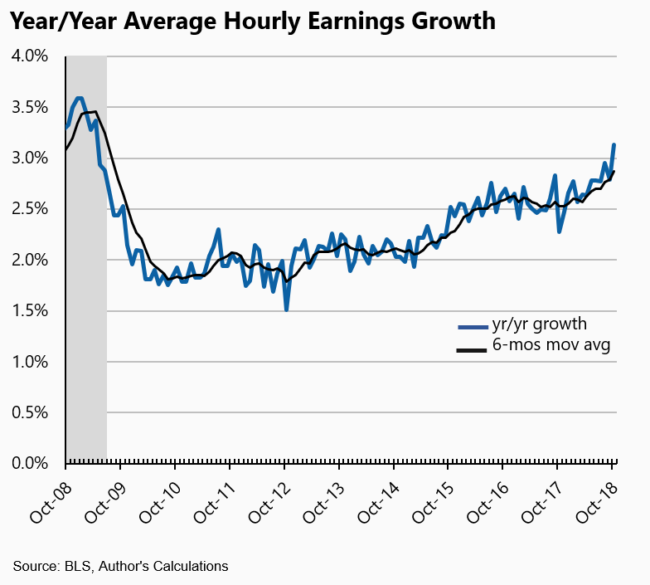 Also, averaging over the past three months shows hourly wages growing at a very strong 3.6 percent annual rate compared to the prior three months. This represents a clear acceleration over the prior two “quarters,” when annualized growth was 2.6 and 3 percent, respectively. In other words, the U.S. job market is tighter than it has been in decades and this dynamic is revealing at least two important insights. The first, which we knew, is that slack matters: the absence of full employment saps worker bargaining power and constrains wage growth. When we move toward full capacity in the job market, workers get back some of the clout they lacked, and employers must share more of the gains with them. Second, and this most economists did not know, is that there was and still probably is more room-to-run in the labor market than conventional wisdom believed and thus more room for non-inflationary gains. The distributional implications of this critical insight cannot be overstated: full employment provides the biggest gains to the least advantaged, too many of whom have long been left behind in previous economic expansions. Our monthly smoother, which averages over 3, 6, and 12-month windows to get a better look at the underlying trend of job growth, shows that trend job gains are north of 200,000, more than enough to push our already low unemployment rate down even further. Is this trend persists, and even if it fades some, it will likely take the jobless rate down to below 3.5 percent in coming months. As noted, the tighter job market has delivered faster wage growth. The smooth trend in the next two figures show a slow staircase of wage gains, from around 2 percent in 2013, to 2.5 percent around 2016, to closing in on around 3 percent now. Contrast this staircase with the “elevator down” shortly after the recession. 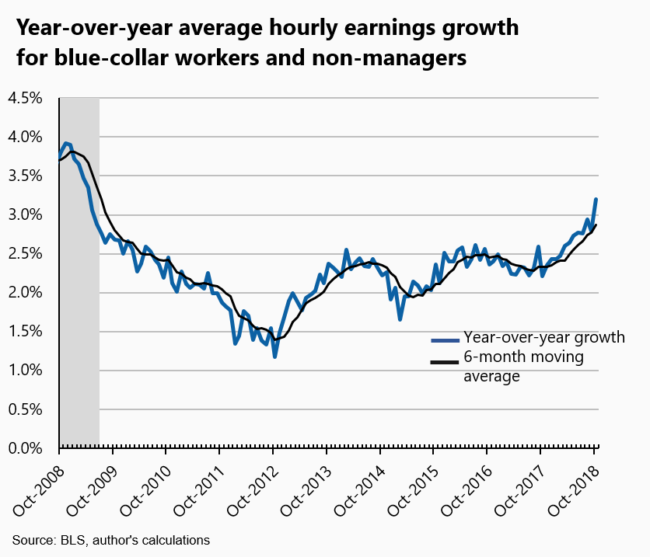 This pattern of sharp wage-growth losses and slow wage-growth gains is precisely why it is so important for policy makers to preserve and build on the gains generated by the close-to-full-capacity job market. This admonition is especially the case when we consider how “anchored” price growth has been. 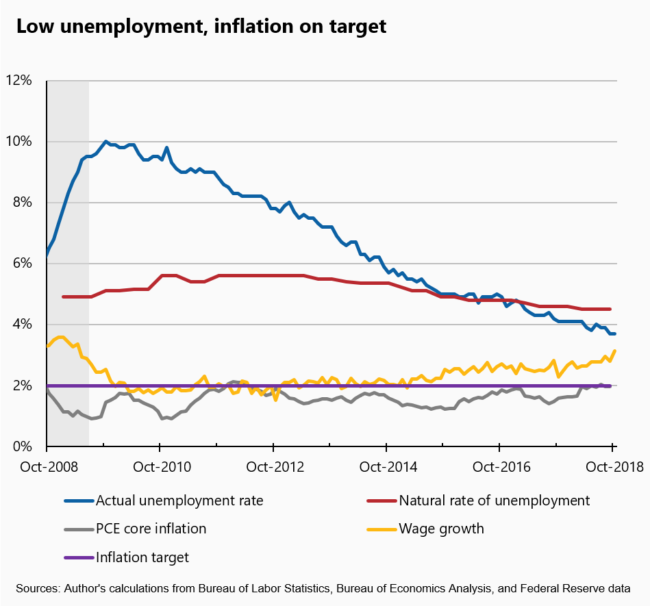 The next figure shows that as the unemployment rate has fallen well below the Fed’s estimate of the “natural rate”—the lowest rate they believe to be consistent with stable inflation—price growth remained at the Fed’s 2 percent target. This anchored inflation dynamic has held even as wage growth has picked up. Based on these relationships, I and others have suggested the Fed consider pausing in their interest-rate hiking campaign. This is a unique moment for a truly data-driven Fed to build on these critically important labor market gains that are finally—nine years into the expansion—deliver some potentially lasting gains to middle- and low-wage workers. Finally, a political note. In applauding this strong report a few days ahead of a uniquely important midterm, it is impossible (for me, at least) to discuss the current job market apart from its political implications. First, one reason for the very tight labor market is the tax cut and spending bills that were added to the deficit, which at 4 percent of GDP, is far higher than it should be at this stage of the recovery. This deficit spending is boosting the growth rate by perhaps a percentage point, which I (along with most other economists) believe will start to fade later next year. In other words, the policy agenda of piling onto the budget deficit when the economy is already closing in on full employment has, to its credit, revealed more labor capacity than most economists and the Fed believed was available. But it is also robbing the U.S. Treasury of much needed revenue at a time when we’re going to need more, not less, revenues to meet the fiscal challenges we face. Moreover, Trump is clearly building on trends he inherited. His constant refrain that the job market was terrible before he got here is the fakest of fake news. And then there’s the reckless trade policy, the hateful rhetoric with its murderous consequences, the chaotic dysfunction at the highest levels, and the never-ending stream of lies. I like a full employment labor market as much—surely more—than anyone. But I guarantee you it’s possible to achieve it without all the hate. Share the post "Another strong jobs report yields critical insights"
3 comments in reply to "Another strong jobs report yields critical insights"
If it were true that “I like a full employment labor market as much—surely more—than anyone,” then you would despise Jeff Sessions as an immigration wimp for not making e-verify mandatory. I watch you frequently on MSNBC when you are asked about the economy. My question to you is why doesn’t anyone speak to the fact that the people who have exhausted their unemployment benefits and still haven’t found employment they are no longer counted in the unemployed demographics. It’s my belief that because those individuals are no longer counted the unemployment number are actually distorted. For example, the number of weeks of Unemployment Benefits that are allowed when a person doesn’t have to accept a job less than what they were making before being laid off or their company moved is lowered. Then, that person may be given extended benefits which they will have to take whatever job the State Employment Office offers which may not come close to what they were making and may not be as much as the unemployment check. Once the extended benefits are exhausted and that person still didn’t find a job they are no longer counted on the unemployed rolls.